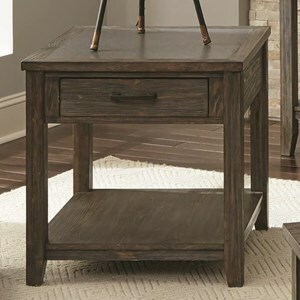 Enjoy the classy, refreshing design of the Camden Town End Table in your living and entertaining space. It is perfect next to your sofa or chair. 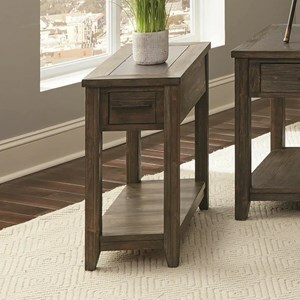 Constructed of Mindy solids and veneer, it features turned metal legs with small bun feet that add a contemporary touch to its design. 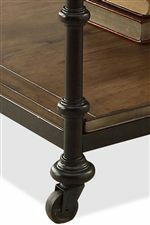 A Hampton Road Ash finish emanates beautiful, light brown tones to match your decor. Below the spacious table top are two inlay shelves that offer room for home accents, decorations, and living accessories. 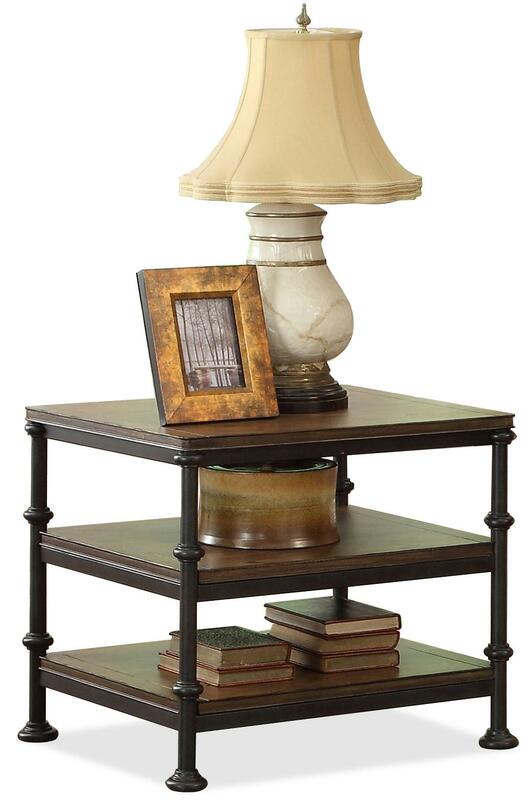 Place a lamp and photo on the table top and additional photos and accents on each of the shelves. 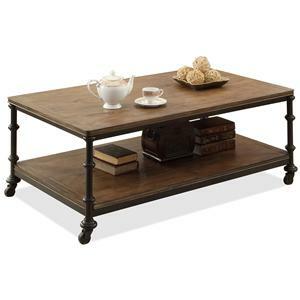 The Camden Town End Table is both storage-savvy and stylish to decorate your home. 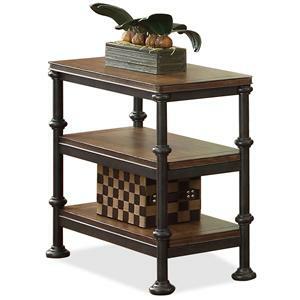 The Camden Town Rectangular End Table with 2 Shelves by Riverside Furniture at Value City Furniture in the New Jersey, NJ, Staten Island, Hoboken area. Product availability may vary. Contact us for the most current availability on this product. Wood & Finish You'll appreciate the multiple-step application of Riverside's furniture finishes. Finishing processes involve several steps of hand sanding, applications of several types of finishing coats, padding and polishing. Handles & Hardware Tip restraining hardware. 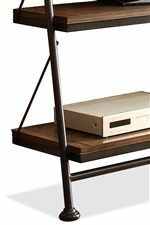 Drawer / Shelf Construction It's the cabinetmaker's choice for making drawer joints that won't pull apart over the years: Riverside feature a craftsmen dovetail joints both in the front and the back of the drawer. Case Construction Constructed of Mindy solid and veneer. A combination of cabinetmaker hardwood solids and hand-selected veneers applied over medium density fiberboard (MDF) and particle board. MDF and particle board are used in quality furniture for surfaces that require stability against the varying environmental conditions in modern homes. The use of these materials allows Riverside to design heirloom quality furnishings that are not only beautiful, but will increase in value through the years. 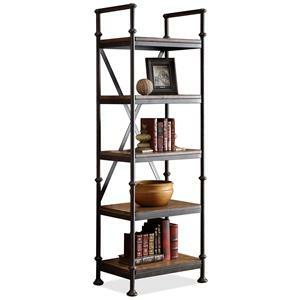 Craft a casual, transitionally-styled home with Camden Town. Including occasional, entertainment, and office pieces, Camden Town has a fresh take on design with simplicity as its focal point. 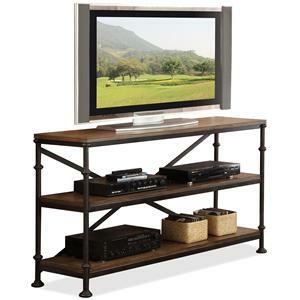 It is crafted from Mindy solids and veneers and features a light Hampton Road Ash finish. 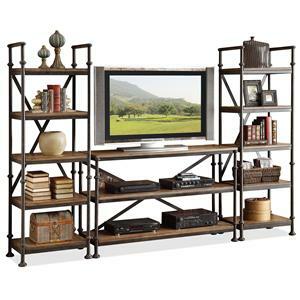 Details like metal legs, caster wheels, and inlay shelving offer comforting details to best accomodate your needs. 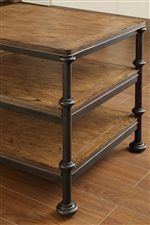 The Camden Town collection is a great option if you are looking for Transitional furniture in the New Jersey, NJ, Staten Island, Hoboken area. 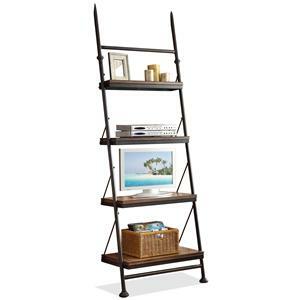 Browse other items in the Camden Town collection from Value City Furniture in the New Jersey, NJ, Staten Island, Hoboken area.